Add the flour, salt, sugar, xanthan gum, bicarbonate of soda and yeast to a bowl. Mix the oil, water and vinegar together and add. Mix the milk and egg together and add gradually mixing all the time to form dough. Remove from the bowl and on a floured surface knead the dough for 2 - 3 minutes until it comes together completely. Place back in the bowl and cover, leave in a warm place for 1 – 1 ½ hours to prove and increase in size. Once proved remove the dough from the bowl and cut into 4 equal pieces. Roll each piece into a ball. To a food processor bowl add the basil, pine nuts, parmesan, salt and pepper and blend. Mix the tomato puree and garlic together. Roll each ball out to approx. 20cm in size. 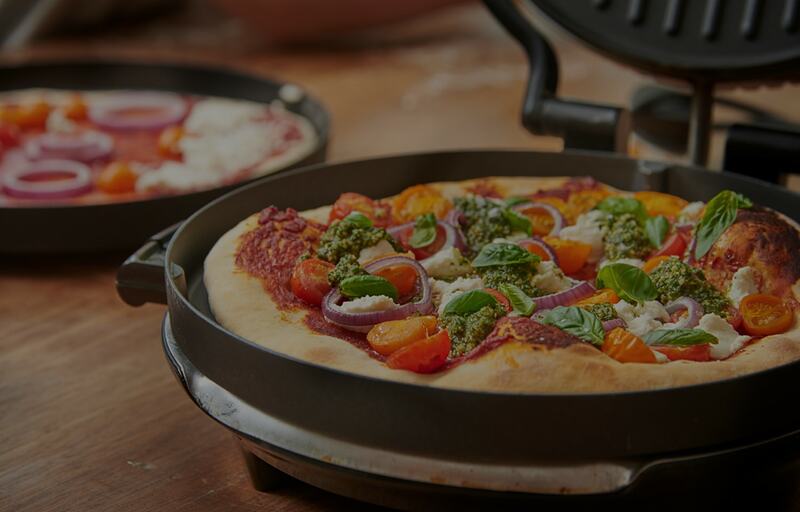 Place a rolled out pizza base into the deep pan grill plate and spread with a thin layer of tomato puree. Add the cherry tomatoes, ricotta cheese, onion and basil leaves evenly over the base. Finally add some of the pesto and season. Attach the grill plates to the grill and turn on high. When heated carefully open the grill and remove the bottom plate and put the deep pan plate with the pizza onto the grill. Close the lid and cook for 15- 20 minutes.